It's a huge mess out there on the sawmill and all those wooden blocks should be delivered to the right positions. Your bulldozer is the only thing that might help. Can you make everything quickly? 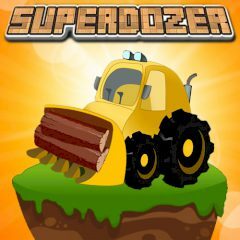 The work on the sawmill never ends and your bulldozer works without a rest. Every time when there is a huge tree sawed off, you have a lot of work to do. Deliver all wooden blocks to the destination points without using too many moves. Think fast, otherwise the work will stop because of you.